PALERMO | Corporate Real Estate Advisors offers the most targeted corporate real estate advisory services and transactional representation in The Woodlands and North Houston Corridor including specifically: Turnkey Project Management/Development, Comprehensive Tenant Brokerage Services, Financial Structuring, Tax Abatement and Municipal Incentive Negotiation, Expert Witness Testimony, and Corporate Relocation. Managing Principal, Damon Palermo’s previous, extensive landlord experience and unique corporate knowledge base uniquely serves to the advantage of the firm’s clientele when negotiating and structuring complex real estate transactions. In the market upon which PALERMO | CREA operates, the table has been turned to the client’s advantage. PALERMO|Corporate Real Estate Advisors is pleased to announce that Managing Principal Damon Palermo, SIOR has been named a 2012 CoStar Power Broker by CoStar Group, Inc. (NASDAQ: CSGP), commercial real estate’s leading internet provider of information, analytics and marketing services. This annual award recognizes distinguished professionals in commercial real estate brokerage by highlighting the achievements of the U.S. firms and individual brokers who closed the highest transaction volumes in commercial property sales or leases in 2012 in their respective markets. Palermo qualified as one of the top commercial brokers in the Houston Office Market based on the total leasing transactions he closed during the year. In order to be selected for this honor, Palermo was evaluated against other commercial real estate brokers active in the region by the CoStar Group, and subsequently ranked among the top advisors in Houston. Significant transactions closed by Palermo in 2012 included several high profile petro-chemical clients who targeted The Woodlands sub-market. The real estate consulting firm, PALERMO | Corporate Real Estate Advisors, recently concluded a broad service agreement for Repsol Services Company in The Woodlands, Texas. The boutique firm was responsible for transactional brokerage representation and comprehensive project management services including design, engineering, and construction oversight, and support and coordination of existing furniture rehabilitation and base level IT infrastructure tied to Repsol’s recent lease of 48,000 sf of office space at 8401 New Trails Drive. Additionally, PALERMO CREA provided lease consultation and successfully negotiated and procured four municipal tax abatement contracts eclipsing a ten-year term for Repsol’s lease of 186,000 sf within Building 5 of the Research Forest Lakeside development. “We are privileged to participate in Repsol’s corporate expansion within The Woodlands”, said Damon Palermo, SIOR managing principal of the boutique corporate real estate practice group. Repsol Services Company provides procurement and other services internally to its US affiliates, all of which are indirect subsidiaries of Repsol S.A., an integrated Spanish oil and gas company which operates in more than 30 countries and has over 36,000 employees worldwide. 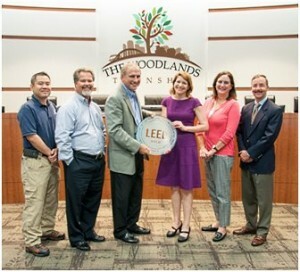 THE WOODLANDS, TEXAS (July 25, 2013) – The Woodlands Township Town Hall building recently earned a LEED® Gold certification from the U.S. Green Building Council. The LEED (Leadership in Energy & Environmental Design) certification is recognized as the premier mark of achievement in green building. The U.S. Green Building Council uses the LEED certification system to rate building sustainability. The two-year certification process awards points in seven categories: Sustainable Sites, Water Efficiency, Energy and Atmosphere, Materials and Resources, Indoor Environmental Quality, Innovation in Design and Regional Priority Credits. The total points awarded determines the level of certification: Certified (40 – 49 points), Silver (50 – 59 points), Gold (60 – 79 points) or Platinum (80 points or more). The Town Hall building is currently rated 62 points out of a possible 110, achieving the Gold level. LEED-certified buildings cost less to operate by reducing energy and water usage. Certification also increases the property value of the building. The Township purchased and renovated the Town Hall building, located at 2801 Technology Forest Blvd., to consolidate four different office locations into one facility, thereby reducing costs and increasing operational efficiencies. During the renovation, most of which occurred in 2011, the Township replaced outdated water fixtures with low-flow fixtures and auto-sensor lavatories. These fixtures save more than 40 percent of water use in comparison with typical office buildings. Many existing light fixtures were re-used, and any new lighting was selected to be as energy efficient as possible. Over 75 percent of all computer equipment and appliances used throughout the building are Energy Star rated. The installation of HVAC systems and water heating systems were thoroughly inspected by an independent building efficiency agent to prevent energy inefficiencies. The majority (78 percent) of the construction debris generated during the renovation was diverted from the landfill. Doors, hardware, moveable partitions and cabinets were re-used from the existing building, saving money and natural resources. Low-emitting paints, adhesives, sealants, flooring and Green Guard Certified furniture were also used to ensure indoor air quality. The Town Hall building is located at 2801 Technology Forest Boulevard, The Woodlands, Texas 77381. For the latest news and information on The Woodlands Township government, please call 281-210-3800 or visit www.thewoodlandstownship-tx.gov. PHOTO: The Township certification team holds the LEED Gold plaque that will be displayed in the Town Hall building. Left to right: Township Information Technology Director William Pham, Township Assistant General Manager John Powers, Township President Don Norrell, Kirksey Architecture representatives Melissa O’Neil and Julie Hendricks and Damon Palermo of Palermo Corporate Real Estate Advisors.